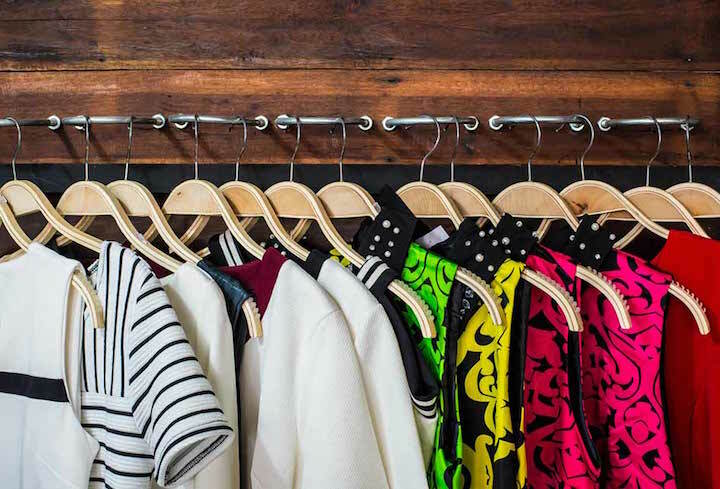 If you’re tripping over pairs of shoes and your hallway can’t cope with the amount of coats falling willy nilly off hooks; this article is for you. To be honest, if you’re human, and you own stuff; this article is for you. 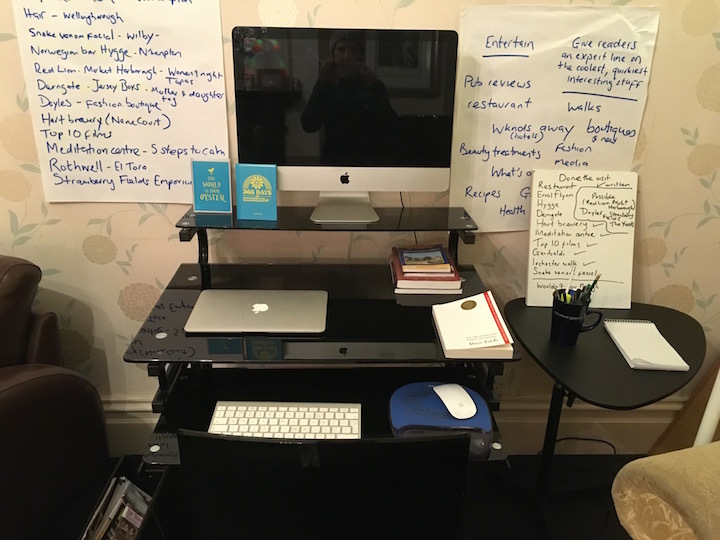 At the beginning of the year, I took Grand Muddy on a Kickstart Your life weekend which is where I first heard about Marie Kondo, the Japanese organizing consultant. 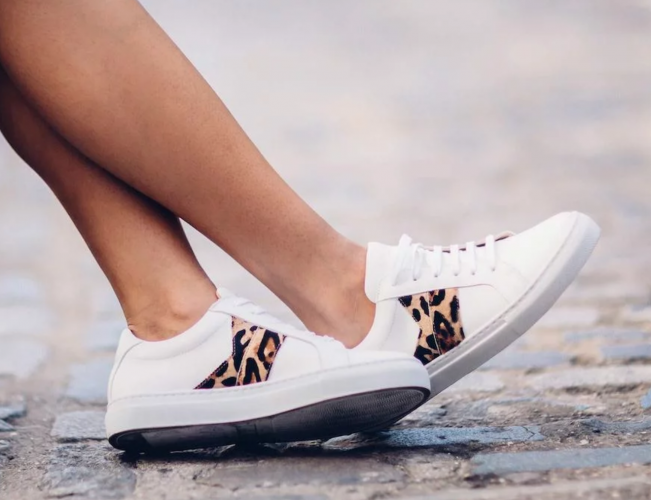 The course leader of the Kickstart your Life course (I know, I know, it sounds all new agey and fandangly, but really, it was pretty cool), Isabelle Losada, spoke almost evangelically about Marie’s methods and how she’d transformed lives (including hers). 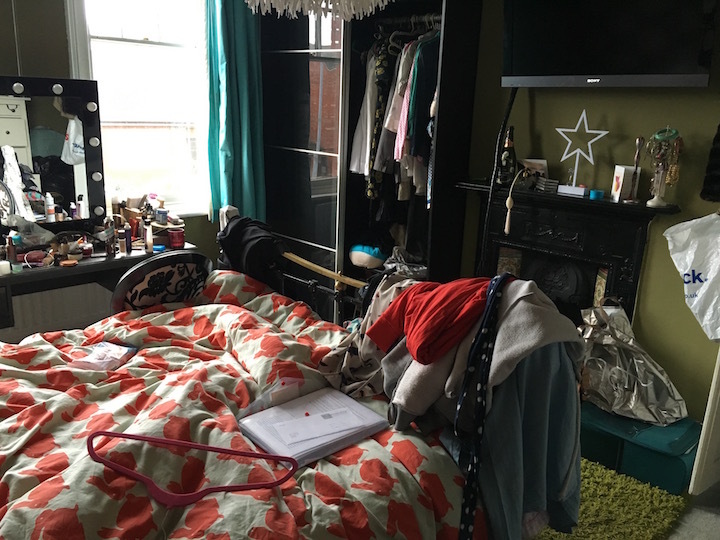 Apparently, there was a decluttering craze going on around the world, that I knew nothing about…(clues below – my bedroom)! 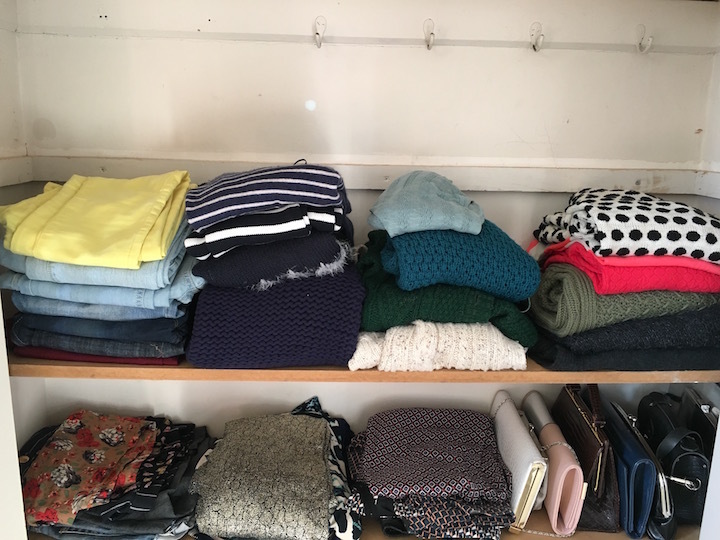 The KonMari Method, or Marie Kondo herself, has basically made a squillion quid by teaching people how to tidy up; and knowing my bedroom as I do, it was clear I needed the services of this Miracle Maker, Ms Kondo. BUT! Number one, she commands a waiting list a mile long, and number two, she’s in Japan. Hmmmmmm, I knew this was a feat I could not undertake myself, but who in Northants could Kondo me? 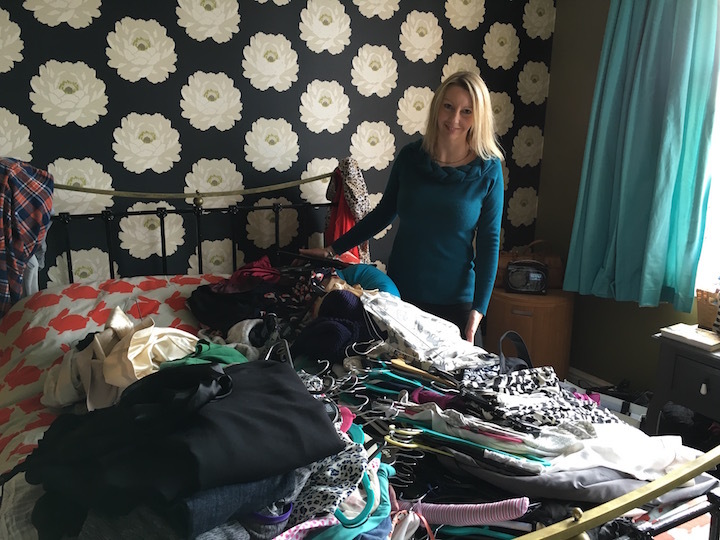 Step forward Declutter Angel, our county’s answer to Marie Kondo, and the lady who would be responsible for letting Mr Muddy move his clothes back into the Muddy bedroom. 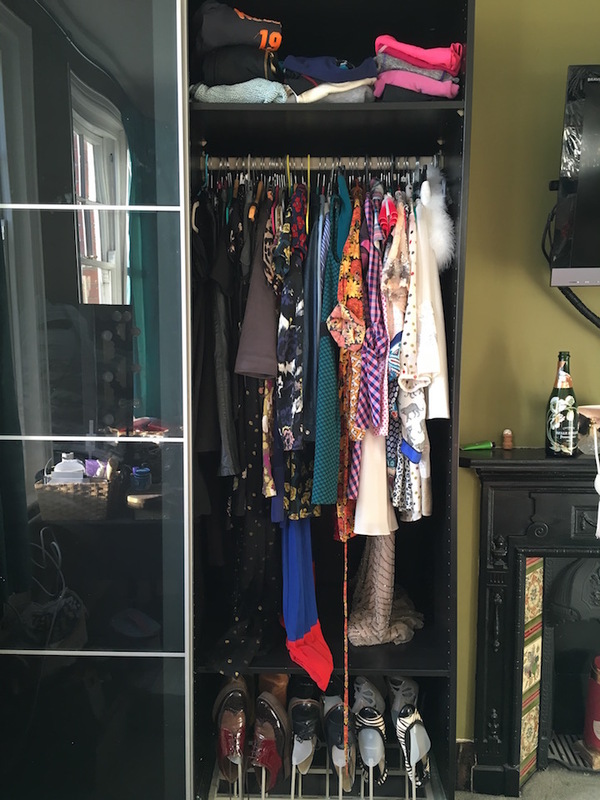 I have a whole house that could be perceived as clutterous, but I thought, let’s start with the bedroom (or more specifically, my clothes, of which there are many). 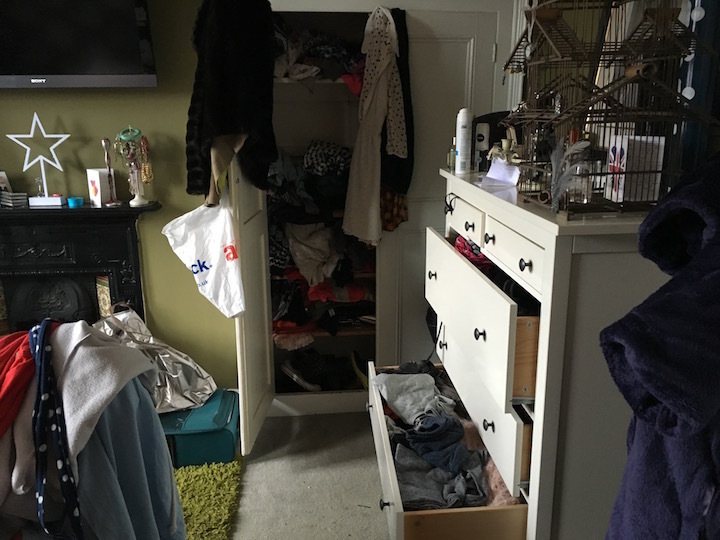 Karen’s steps for the actual clear out are precise and easy (10 tips at the end of the bog), but to kick off, empty your cupboards and drawers and then methodically work your way through everything. Surprisingly simple really! 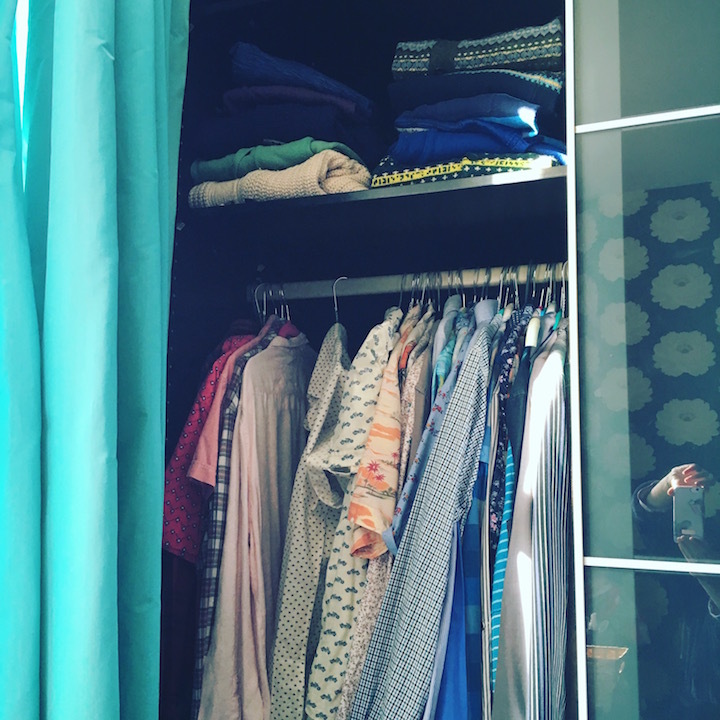 Marie Kondo has a two-pronged approach to tidying. Firstly, put your hands on everything you own, ask yourself if it sparks joy, and if it doesn’t, thank it for its service and get rid of it. Secondly, once only your most joy-giving belongings remain, put every item in a place where it’s visible, accessible, and easy to grab and then put it back. Only then, Kondo says, will you have reached the nirvana of housekeeping, and never have to clean again. I think Karen, Declutter Angel extraordinaire is a little more practical than that. For instance I have jeans that I no longer love, or spark joy, but they’re good for gardening and walking the dog; ergo they stay. I liked this approach. I still got rid of loads of stuff, but had things left for practicalities, like life. 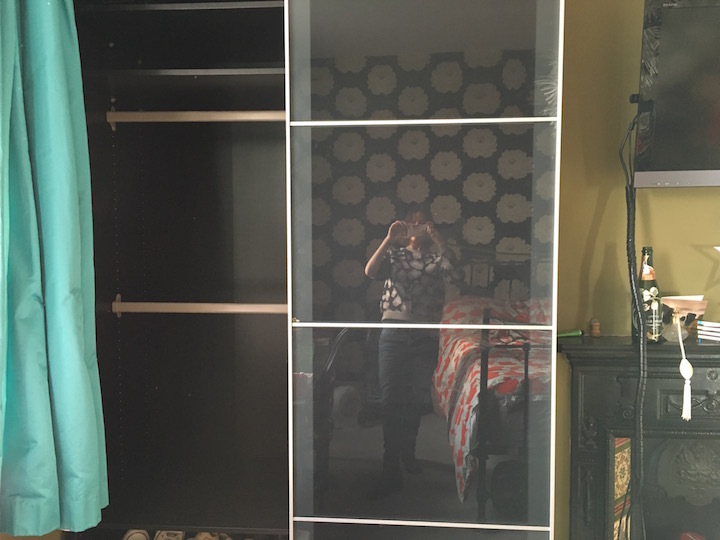 We colour coded the wardrobe from left to right, white to black and everything in-between, hanging up all dresses, skirts and trousers (gym gear on the ledge above). Tops and jumpers were put in drawers and we arranged them in terms of dressy, every day and odd job (dog walking/gardening). The whole process took a few hours and facilitated me getting rid of more stuff than in ten collective declutters I’d attempted myself. Karen doesn’t make you get rid of anything you don’t want to, I think she just makes it easier to make the decision. And do you know what? I haven’t missed a thing! 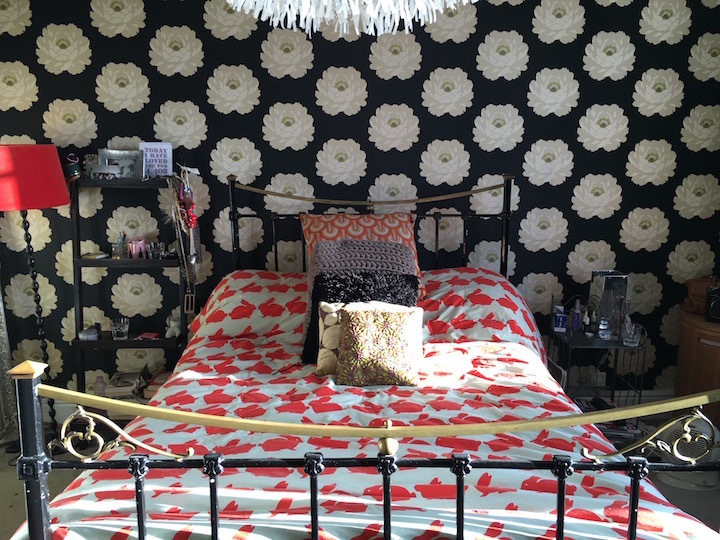 It’s been a couple of months since the declutter (I wanted to se if it lasted), and although my bedroom can slip back into low level untidiness, it’s nowhere near how it was before. 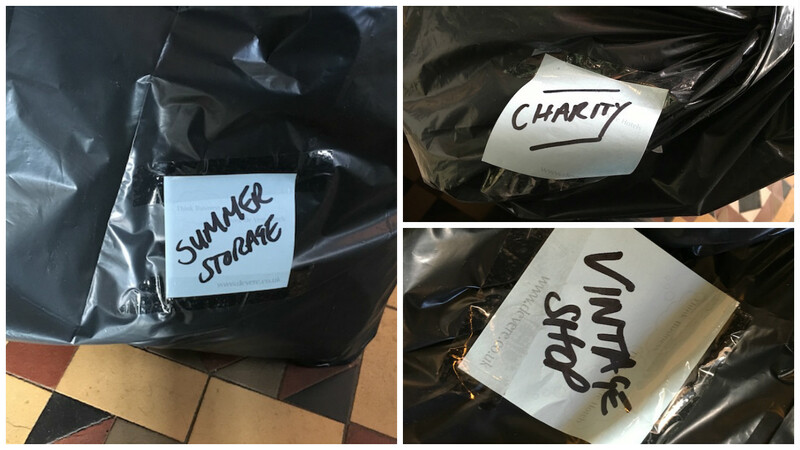 And more importantly, the colour coding and location system we set in place for the clothes, has worked! And it’s definitely true about decluttering, it really does clear your mind. Will I ever be Monica from Friends? Nah! But all in all, this was a resounding success, and gave me the kickstart I needed to stop living like a bag lady! 1. Visualise how you would love your space to look before you start, and this will help to achieve your goal. 2. Focus on just one room, or one area of the room, then you will see clearly the progress you make. 3. Remove everything that doesn’t belong in that room or space as you go along. 4. 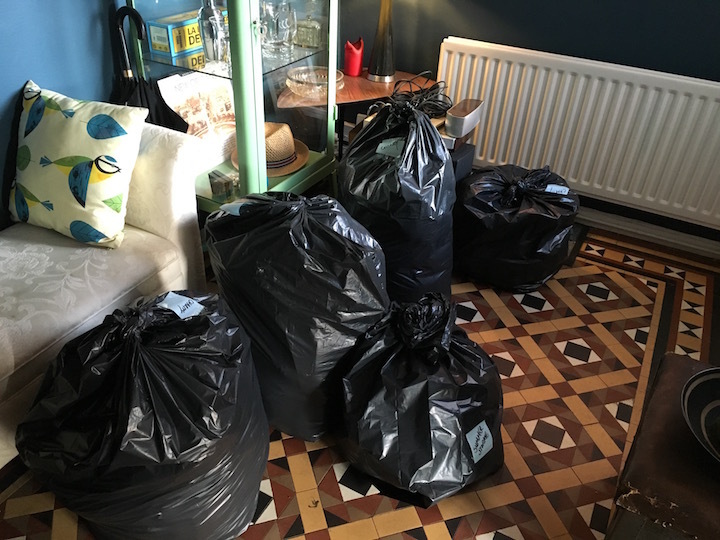 Keep two bags with you – one for rubbish and one for charity to clear out the items which you no longer need (and even have a little dust as you go, it all makes a difference). 5. 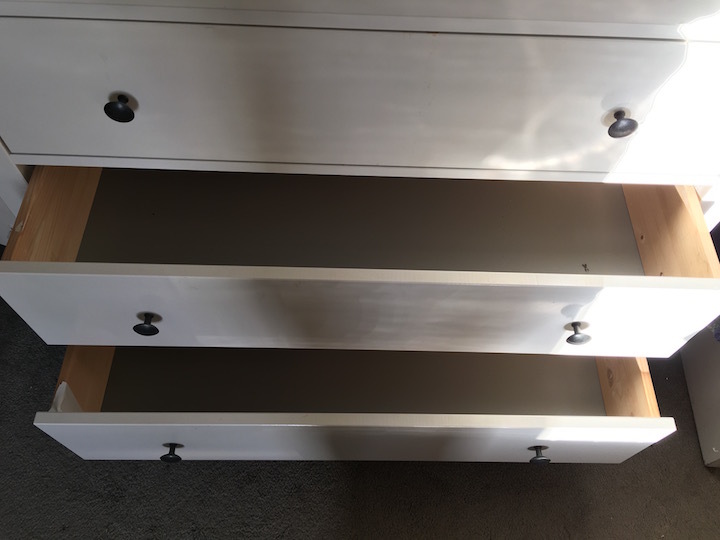 Stacking items in drawers vertically or horizontally on hanging shelves in wardrobes, stores far more and helps you see everything more easily. 6. Have an area for your paperwork and put your post/receipts etc. in the same place and then sort through it daily, shredding and filing as you go. 7. Empty your handbag each day to allow you to file/shred receipts and remove items that no longer need to be at hand. 8. 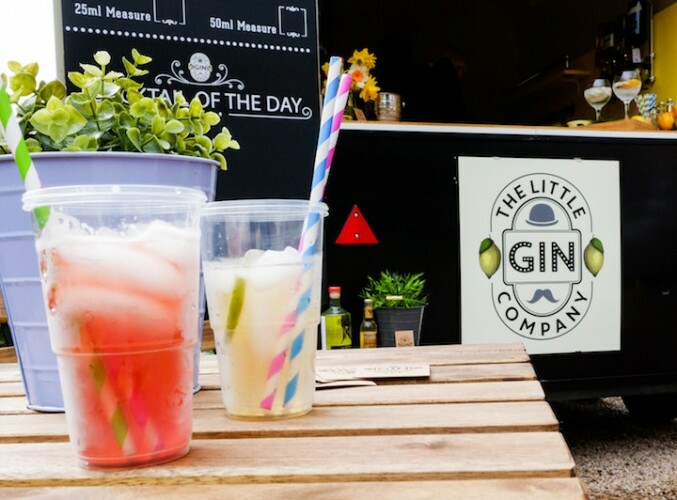 Try not to keep lots of bottles around your shower and bath, ideally store in a cupboard and if you cant manage this have a ‘one bottle of each type’ rule and keep on a shower or bath tidy. 9. Don’t keep things ‘just in case’, it will cause clutter and stress, you will be surprised how clear the future looks when the space in front of you is clear too. 10. Take photos of sentimental items like souvenirs you have no longer need for, file them away and then you will be able to find them when you need to, and they will be out of sight to enable you to look to the future. A final word, don’t give up, if you cant quite afford to get support to help you with the process, commit to 10 minutes a day and as your clutter clears your confidence will grow. It’s £30 per hour (not bad considering I was done in two and a half) and Karen offers an initial one hour consultation at a rate of £20; which will then be taken off your bill if you go ahead.